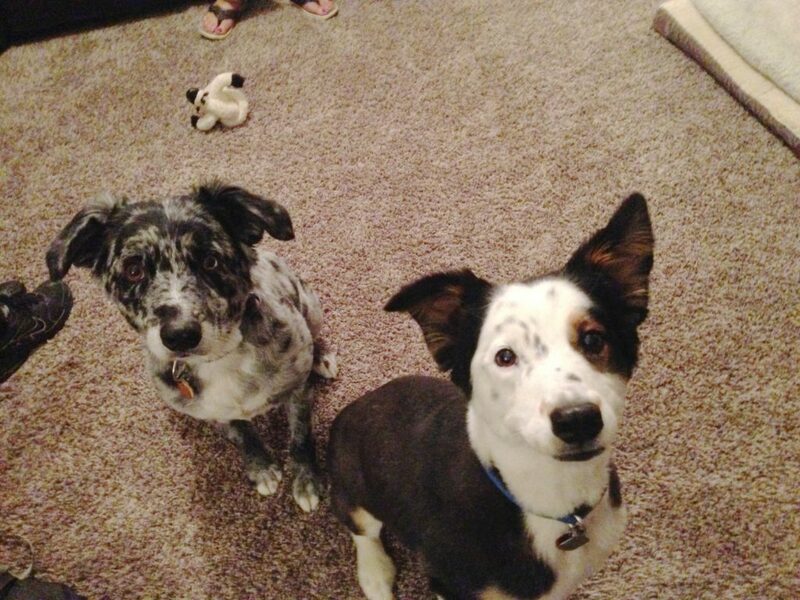 Joey and Willie are a pair of Australian Shepherds who get very excited when people come to the door. Their guardians had a dog obedience training session with our very own Tara Parks to help stop dog jumping up on people who visit, pulling on the leash and redirected aggression to one another when over excited. Joey and Willie were very excited when we arrived for the session. They had difficulty controlling themselves; jumping up, circling around, and invading everyone’s personal space. These dogs needed Dog Gone Problems, lol. As we discussed what their guardians wanted to achieve for the session, a dog should be given the opportunity to settle down on its own, but if an excited state is still present, a leash time out is used. This wasn’t the case, Sam and I were able to correct the dogs and claim everyone’s space and they caught on fairly quickly. After observing Joey and Willie, I had everyone go outside to do a little leash training. Several months ago my Mentor David and I learned a technique called the Reverse Sit. It sounds a little intimidating, but its actually really easy and effective. I spent a few minutes showing the guardians this exercise. If they practice it enough and master the skill, they will be able to teach the dogs to sit down and focus on their guardians on command. This is an easy way to get your dog to focus on you provided you practice it enough at home in calm settings. Once the dog will sit on command, then you can start practicing it on walks and other activities the dog participates in, but only when there aren’t any distractions present. The key with the Reverse Sit is to keep practicing it in easy situations and only move on to more difficult scenarios (with distractions like loud noises, new people and other dogs) once the dog performs the proper technique five times in a row. In the above video, you can see that Willie is tethered to my waist so that my hands are free for treat delivery. When treating your dog, you want to make sure it is within 3 seconds of the dog doing the desired behavior. In this case, it is when the dog sits down when you stop. Once the dog gets the hang of it, then you can add in a command word “Focus” as you deliver the treat. Eventually you should be able to give the command word and get the dog to sit and look up at you on demand. The key to the exercise is to help the dog practice focusing on their handler on command. Starting out, its best to do this in your back yard or a large room inside to limit anything that may distract the dog. Once that is the case, start gradually adding in distractions like music or a TV with a dog barking but the volume down low. Once your dog gets used to focusing on your no matter the distraction is at low volume, start increasing the volume gradually until your dog can block it out and focus on you. Once the dog can do this amongst distractions, inside and then outside without other dogs around, the next step is to find a place where dogs are walking, but at a distance. I test the dog’s reactivity by asking it to sit, then offer a treat when it can see another dog (holding the treat so its in the dog’s line of sight with the other dog). If you can’t get your dog to sit or take the treat when it sees another dog, you are too close. Once you find a distance your dog can take the treat and remain sitting while it sees a dog in the distance, take note of how far away it was. That is the distance you need to start practicing the Reverse Sit at with other dogs. It helps if you can find a path in a park that many people will be walking their dogs along. This way you can have a consistent distance to practice at and many practice opportunities in the row. As soon as your dog sees another dog walking on the path, give it one second to look up at you. If it doesn’t, then you give it the command word to look up at you once the second second passes. If it just stares at the other dog, then repeat the reverse sit exercise by backing up 2-3 paces to redirect the dog’s focus to you. You want your dog to be able to sit and look at the other dog without reacting. If it stares but doesn’t react, then practice the reverse sit (moving parallel to the other dog). You want your dog to be able to see the other dog, but instead of staring or reacting, it looks up at you. You need to keep practicing this exercise at this distance (it may take multiple practice sessions) until the dog looks up at you without needing the prompt. Once the dog gives you an auto focus every time it sees a new dog on the path, the next step is to take 2-3 steps closer to the path and keep practicing until you get 5 auto focuses in a row. Once that is the case you take another 2-3 steps and practice again. Keep practicing and take 2-3 steps closer until you can get right next to the path. Its not uncommon to have to spend a few practice dates at the same distance before moving forward. This is ok. The mistake most people make is moving too close too fast. Let your dog set the pace and only move closer when your dog can give you 5 auto focuses in a row. When doing the exercise, if at first your dog isn’t focusing on you, don’t call its name. Make a kissing sound to get your dog to look at you then start moving away from them as soon as you have their attention. I detached the leash off my waist and gave it to the guardian so I could coach her through the same exercise. In the video, the guardian was on point with the speed of her treat delivery, and getting Willie to focus on her. Willie caught on rather quickly and started anticipating and trying to predict when she was going to move back and stop and was trying to beat her to the punch. Due to this, I had her slow down and take fewer steps to give the dog less time to act on his own and stay focused on his guardian. Another option would be to take more (4 or 5 steps). By varying the delivery location, it keeps the dog guessing as it never knows when the human is going to stop and deliver the treat. Next we addressed the dogs’ unruly behavior at the door. Whenever anyone knocked, the dogs rushed the door and went ahead of their guardian. But when a dog is in front of a human, it sees itself in the leadership position. I had someone step outside to play the part of a guest so i could demonstrate how to claim the door in a structured manner. The dogs did fantastic when I demonstrated the technique myself. But the important thing is that the guardians can accomplish the same thing. So we reset the exercise and I coached the guardians as they handled door duty on their own. In the future when dealing with multiple dogs, you can block areas around the door if you have an open floor plan to make removing them from the door easier. WIllie ended up lying on the floor and David refers to this as “turtling up”, Davids recommendation is to place your foot over one of the dog’s front paws and then slowly start applying pressure. When the dog pulls its foot back, repeat the same process on the opposite paw. You may have to repeat this process 2 to 3 times, but eventually the dog will get up and move away. Just make sure when it does, it moves away from the door. It is always important to stop moving immediately as soon as the dogs go behind the threshold or boundary that you set. Pause about half a second and then deliberately take a few steps back, left foot right foot, before preceding to the next step making sure the dogs are stationary. Make sure that your hips and shoulders are pointed square at the dog. One thing I neglected to mention in the above video, is that the guardian should not move slowly when opening the door. You don’t want to suddenly move in slow motion when opening the door, rapid changes in speed are a big warning for dogs. And this could cause a confusing message and trigger an excited state because now it accentuates what is behind the door. This likely part of the reason the dogs rush the door shortly after. The primary reason was the guardian turned her hips and shoulders away. By keeping her hips and shoulders toward the dogs and only turning her head, she will be able to keep the dogs behind the boundary. After practicing this exercise a few times, she will be able to turn away from the dogs and they should stay behind the boundary. I was quite pleased with how well the guardian recovered. She stayed calm and went right back into it and directed the dogs where she wanted them to be. Life happens. It’s not what happens, it’s how you respond to it. By the end of the session the dogs were less excitable, respected personal space and authority. With the techniques I discussed, the dogs will be able to assume the roles of followers and the guardians in the leadership position. Judging by what I saw and how well the dogs took to the corrections, it shouldn’t take long.